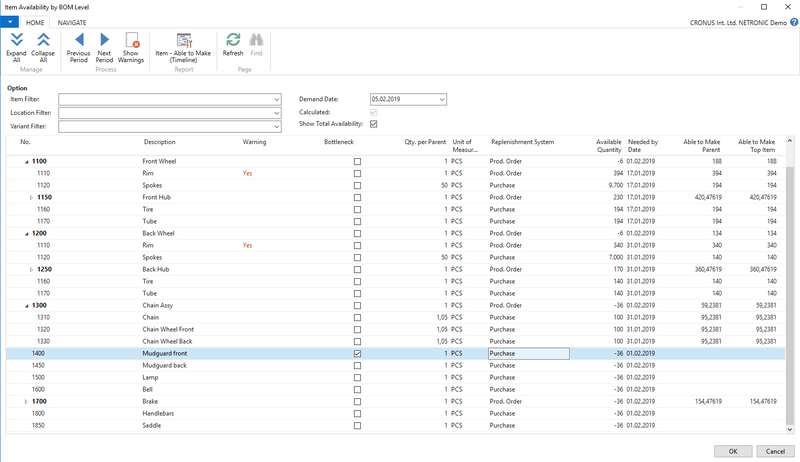 One of the options to keep an eye on material availability is certainly the production BOM that shows which items need to be purchased or produced to make a so-called parent item. This parent item will then either be used for producing another item, as such being called a subassembly, or it is a finished product being ready for sale. Depending on the parts needed for producing an item, the BOM consists of one or more levels. 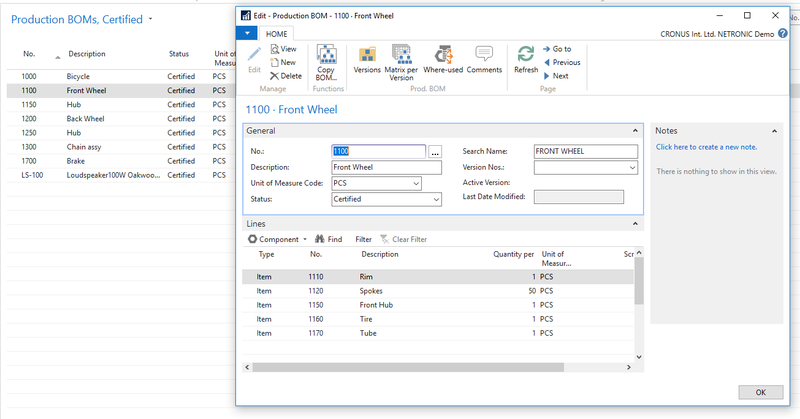 In a single-level production BOM all required items have to be purchased, whereas subassemblies form a multi-level BOM. Furthermore, you can check the material availability for a certain order by the “Item Availability by BOM Level” dialog. The information given here is most certainly quite detailed, but, in case of a product with lots and lots of subassemblies you easily might lose overview. So, why not make your life easier and have your BOM visualized? The visual BOM of our Visual Production Scheduler (VPS) provides immediate insight into the material availability and hence plays a crucial role supporting the production planner. 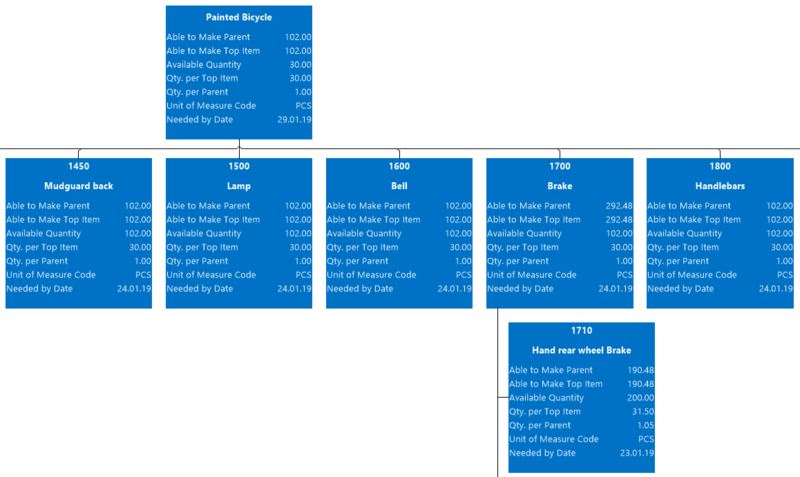 It shows a tree chart view of the bill-of-material, the data fields being taken from NAV as illustrated in the “Item Availability by BOM Level” dialog. For illustrating the valuable support of a visualized form of a BOM, I picked the example of a situation, that, as I believe, all of you are familiar with. Just imagine: The production schedule is released, capacity utilization is high and all processes are running smooth ... when a customer calls and asks if you can finish his production order two days earlier. Especially short-term changes to the production schedule require transparent information about the material availability, about capacity bottlenecks and delivery time conflicts. Now its’s important to quickly gain clear-cut overview which could be quite a bit cumbersome when only done with the help of the NAV BOMs. Furthermore, the BOM lets you simulate the material availability not only for the planned start date and quantity of this production order but you can also check the availability at other dates or for other quantities by changing the values with a date picker. When committing the date/quantity change by pressing ENTER, the visual BOM immediately simulates the material availability for that specific production order with the new values, letting the planner immediately see whether he can start earlier or not. In the latter case, he also sees the missing components and subassemblies and can take further actions accordingly. Please note that only the modified demand date will be saved to NAV after having confirmed with OK, the PO Quantity will not be changed. In addition to the above described visual BOM, the VPS lets you highlight material shortfalls by indicators. As having been outlined in the blog about custom indicators, there are various sensitive areas in the operational processes of manufacturing companies the planner has to pay particular attention to. One of these areas is certainly the overview of whether enough material for a certain order is on stock. The indicator functionality in the Visual Production Scheduler allows to modify the main font color (from 27 available colors) of the planning table responding to individual business logic. So you could, e.g., let material shortfalls appear in red font color. Following the instructions given in the above mentioned blog, you can choose whether to modify the font color in the table area on Production Order level and/or on operation level in the Gantt chart area. In the following screenshot the red Production Order number in the table area indicates a material shortfall for this order, this shortfall getting further specified in the diagram area by indicating the respective operation by a purple Production Order number. Watch a video about using the BOM in the VPS. Learn how conflict management is done in the VPS.